1. Nobody is sick. I’m almost scared to say that out loud for fear of jinxing it and bringing the Germ Fairy back to our house. But for the moment, nobody has The Crud. So that’s awesome. 3. 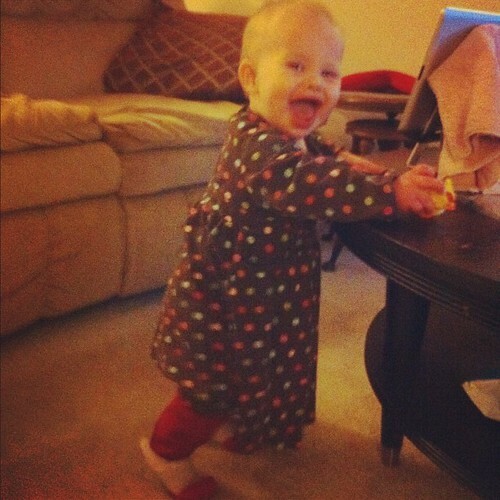 Lucy seems to have figured out this whole “standing up” thing. Now I need to hurry up and figure out the whole “baby proofing” thing, because man, she is into EVERYTHING. And unlike Catie, Lucy wants to put EVERYTHING in her mouth. I can’t even tell you how many times I’ve had to stick my fingers in her mouth to fish out something she shouldn’t have gotten. Neither of us are happy when this happens, and yet, she keeps doing it. Babies really don’t catch on quickly, do they? 4. I’ve been having late night Skype dates with Matt after the kids are in bed. I think my crush on that guy is bigger than it was back in 1999. He makes me giddy. 5. I’m going out with a girlfriend tonight while my parents watch the kids. I can’t wait. I need to get dressed up and get out of Mommy Mode for a while. So yeah. Pretty good week here overall.